An array of colorful boxes arranged side by side and stacked flawlessly on top of each other like a Lego set. Their contents are filled with 90 percent of everything we buy — cheap t-shirts, new television sets, breakfast cereal, coal and bananas. 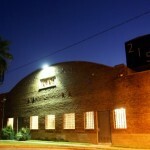 Trading ocean for desert, Phoenix has become a new destination for some of these containers. Their new contents: families and businesses. 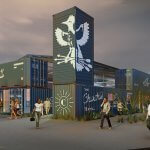 A downtown Phoenix architecture firm founded by Brian Stark, Local Studio, is on the forefront of turning to shipping containers as an innovative building material for new developments in the city. The Churchill opened August 2018. 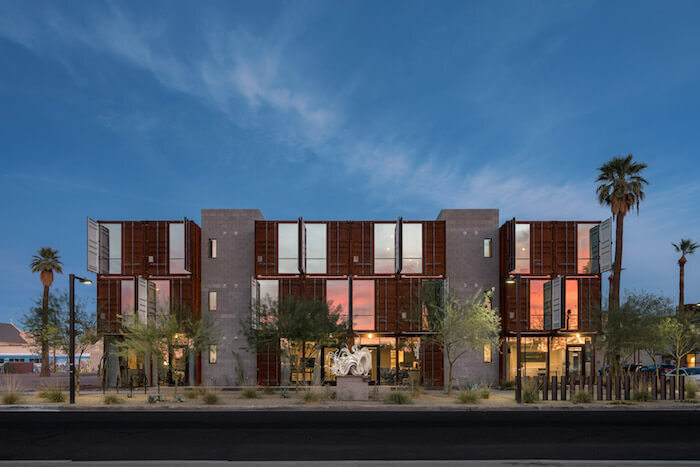 Inspired by similar projects across other major U.S. cities, the movement towards shipping containers and tiny homes has taken on a new life in downtown Phoenix with developments including Containers on Grand, The Oscar and The Churchill. Turning 16 shipping containers into a fully residential eight-apartment unit on an old used car lot, Containers on Grand was the first of its kind on the West Coast. Kathleen Santin, a partner in the The Oscar and Containers on Grand projects, said the success of Containers on Grand led to the plans and development of The Oscar. The Oscar opened May 2017 on the intersection of Portland and Second streets with residential units on the second level and semi-commercial units through a partnership with a startup company, Wanderjaunt, on ground level. These units and apartment units have been wildly successful and have attracted people from all over the world. The re-use of shipping containers is uncommon because it is cheaper for most companies to build new containers rather than shipping the empty containers back to port for refill. As a result, millions of empty shipping containers sit at ports all around the world at all times. “What people forget is that the shipping containers sitting at the ports get shipped up the coast to get melted which is a huge environmental assault,” Santin said. 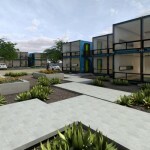 While re-purposing the shipping containers is still not the best solution to the environmental problems these idle containers present, the adaptive re-use of the containers in transforming them into homes and businesses heightens the sustainability and energy efficiency of the containers. “The highest utility bill that a tenant at Containers on Grand has had to date is $86 and he works at home and keeps his house frigid during the middle of the summer,” Santin said. Beyond sustainability, the projects are unique in a multitude of other ways. In an attempt to cater to the artistic community near Roosevelt and honor the history of the containers, the developers sandblasted the outside of the containers and left the original wood and markings inside the containers. The Oscar. Photo courtesy of Local Studio. With pollution, weather and time the look of the containers of the containers are continuing to evolve which Santin said is appealing to both the tenants and the neighborhoods. That collaboration with the city is key to the success of any development of this nature because shipping containers simply aren’t a part of the city’s code. Miguel Victor, downtown commercial infill team leader for the City of Phoenix, said the hardest part is that these projects here in Phoenix were among the first in the nation. “It is really difficult for the developers to comply with our current building codes because a container wasn’t designed to be used as a habitable space,” Victor said. Regardless of some of the difficulties, they are very appealing from an infill perspective. Shipping container projects are cheaper, built faster and more sustainable than most of the alternatives. Victor said learning how to have these projects meet city codes is paving the way for making these developments more and more popular across Phoenix. 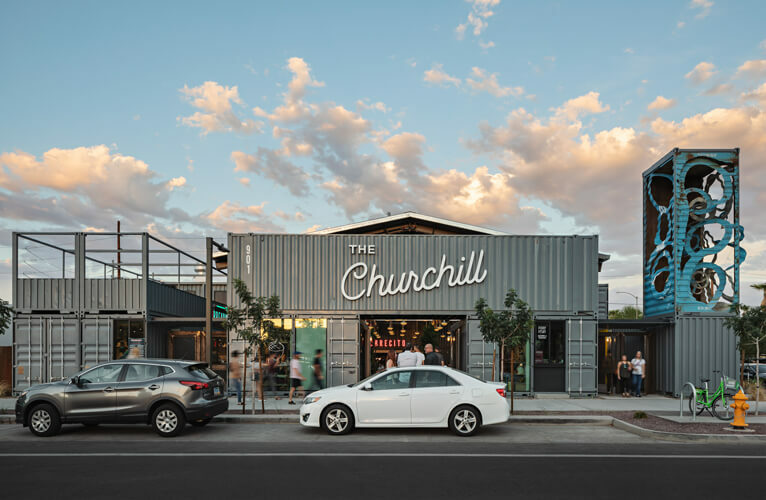 The opening of The Churchill on Sept. 1 marked the start of the next wave of shipping container developments in the Valley. 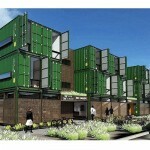 The third shipping container project in three years, the marketplace design is the first of its kind locally. 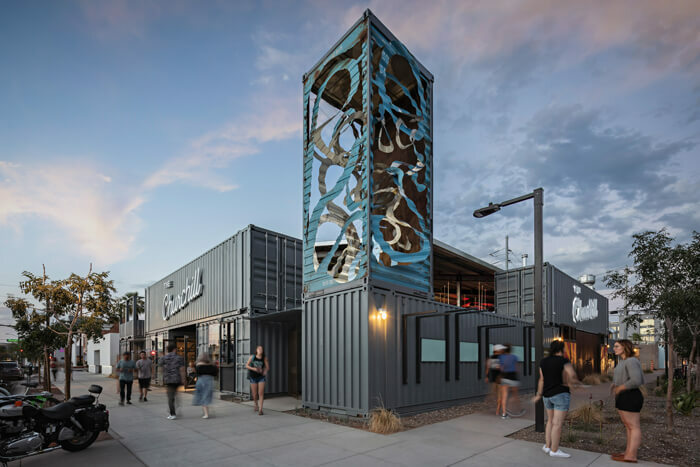 In collaboration with Local Studio, entrepreneurs Hartley Rodie and Kell Duncan are using shipping containers to house 10 small businesses and restaurants in a 14,000 square foot lot containing 19 decommissioned shipping containers. 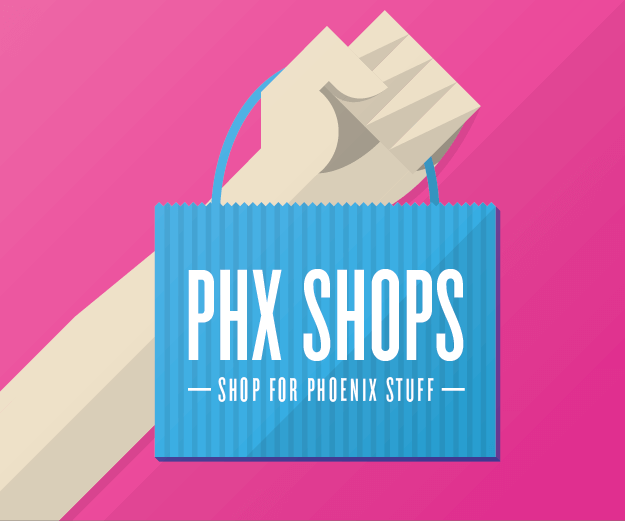 The marketplace is complete with a 30 foot vertical container sculpture by local Phoenix artist, Peter Deise. Pete Deise sculpture on southwest corner of The Churchill. Duncan was inspired by similar projects in places like Austin and San Antonio. “I thought it was the best way to fit a large number of small businesses in a small space,” Duncan said. 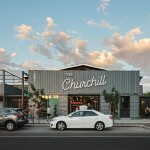 The Churchill features popular names including Pedal Haus Brewery and State Forty Eight as well as an array of other eateries, retailers and boutiques. As part of the lease agreement, tenants of the space participate in a system of social rent in which four hours of community service is obligatory every month. 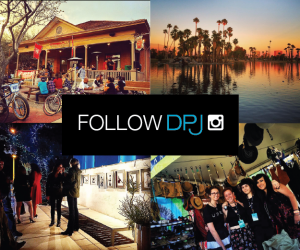 “We wanted to do a community focused project with a social aspect,” Duncan said. Duncan said they are hopeful about what this new development will do for the neighborhood. Editor’s note: Santin’s partnership status has been corrected from the original version of this story.